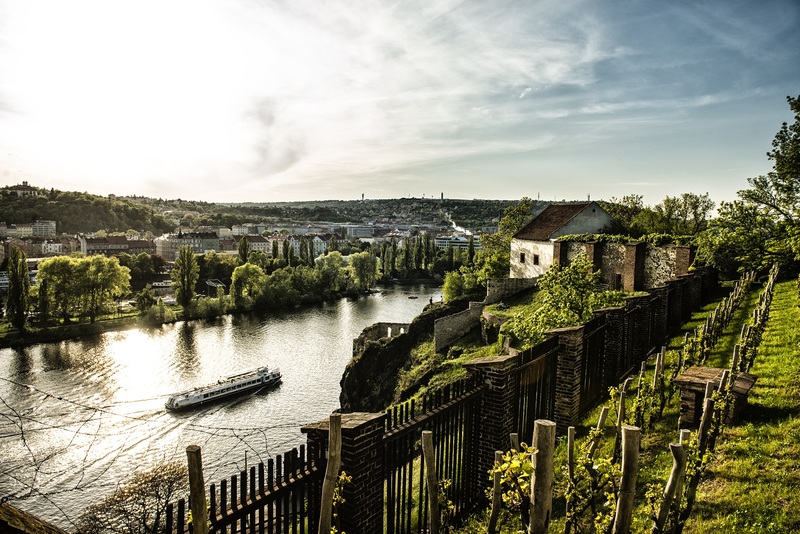 According to ancient legends, Vyšehrad is oldest seat of Czech princes; in fact, the local settlement was established in the mid-10 th century. Situated on a rocky promontory above the Vltava River, it offers stunning views of the city, and the park area holds hidden architectural treasures including the rare Romanesque Rotunda of St Martin, the neo-Gothic Church of Sts Peter and Paul, the national cemetery Slavín, and the underground casements housing the some of the original Baroque statues from the Charles Bridge. 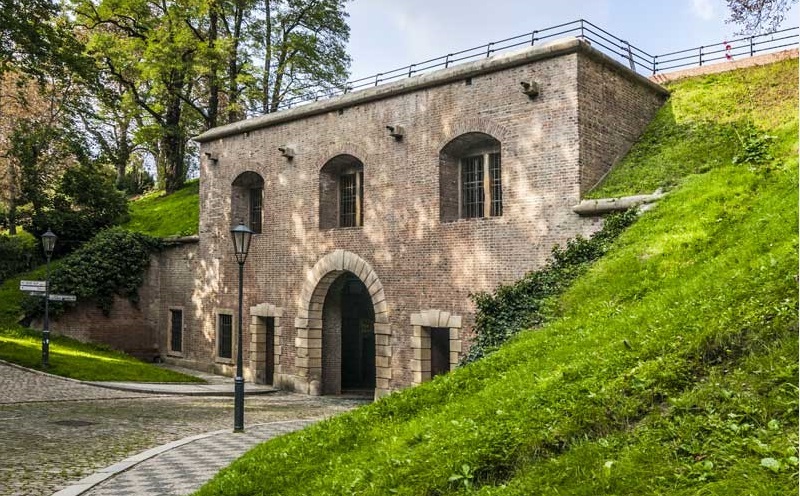 Gorlice - the largest underground space at Vyšehrad was created as part of the 33rd bastion of the Baroque fortifications. The vault, measuring 330 m2 in area and 13 m in height, was originally intended for the gathering of troops, food storage, and use as a munitions store. The space was renovated and made accessible to the public in the 1990s as part of the tour of the casements (walled corridors for troops) and is now home to six of the original statues from the Charles Bridge. Remains of a Gothic gate - wheelchair access. The castle on the Vyšehrad hill, originally called Chrasten, was established during the 10th century, definitely later than Prague Castle. However, it has been furnished with lots of legends, about Princess Libuše, about the Women’s War, about Bivoj, about Horymír, and others, thus evoking the idea of ancient times, yet the historical resources mention no such things. During the reign of Boleslav II, a classic Přemyslid castle was here with a mint plant for manufacturing denarius coins. These coins for the first time contain the designation Vyšehrad (vsgra, vissegrad), which only appears in the written resources later on. Vyšehrad experienced the greatest fame during the 11th century, when it became the seat of the first Bohemian king Vratislav I for certain time, the successors of whom ruled from Vyšehrad until 1140. The original wooden castle was rebuilt to a stone one with new churches and Vyšehrad chapter was established, yet none of that changed its inferior position towards Prague Castle. From the second half of the 12th century, its significance was decreasing, and only Charles IV decided to renew its significance out of respect for his Přemyslid ancestors. He wrote the Coronation regulations for the Bohemian kings, and he included in it the obligation to carry out a pilgrimage to Vyšehrad on the eve of the coronation, where the king is shown bast shoes and a satchel of Přemysl the Ploughman (Oráč). He was the first one to carry out this pilgrimage on the 1st September 1347. In place of the desolate Romanic court, he then built a spectacular royal palace with high arcades and adjoining houses for the castle staff, water conduit and a school. In 1348 - 50 he built new fortifications with battlements, towers, portals and two gates, with the remains of the gate called Peak (Špička) being preserved until today, to be restored by Antonín Wiehl according to the historical resources in 1903. The maze at Petřín is a copy of the Peak. After 1364, the Capitular temple of St. Peter and Paul was rebuilt extensively. Archaeological research in the church uncovered the foundations of a Romanic apse, which was a part of the original basilica from the time after 1070. The basilica was 110 m long and at the time was the largest sacral object of the pre-Hussite Prague. There should be a crypt under the church’s floor, with the remains of the Přemyslid princes Vratislav II, his brother Konrád, Soběslav I and II, yet so far the searching for them has been unsuccessful. 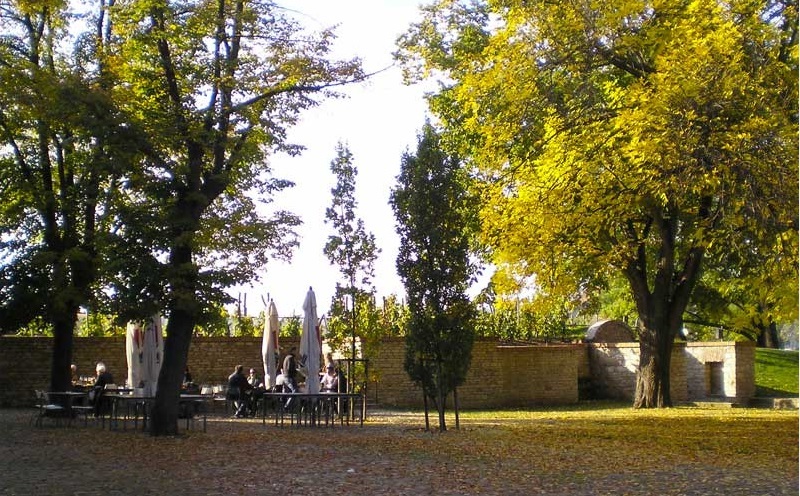 Near the temple, you can see remains of the walls of the former Gothic palace of Charles IV, which was located on the Western side, probably in place of today’s lawn with four sculptural groups by Myslbek. After the Hussite victory over Sigismund in the Battle of Vyšehrad in 1420, all the buildings of that ere were destroyed, except for the rebuilt chapter temple and the romanic Rotunda of St. Martin. The rotunda was built in the 2nd half of the 11th century, and was changed into a gun powder storage house after the fortress was built. Its fate was threatened in 1841, when a new communication was planned between the New Town (Nové město) and Pankrác, yet count Karel Chotek managed to preserve the Romanic rotunda. 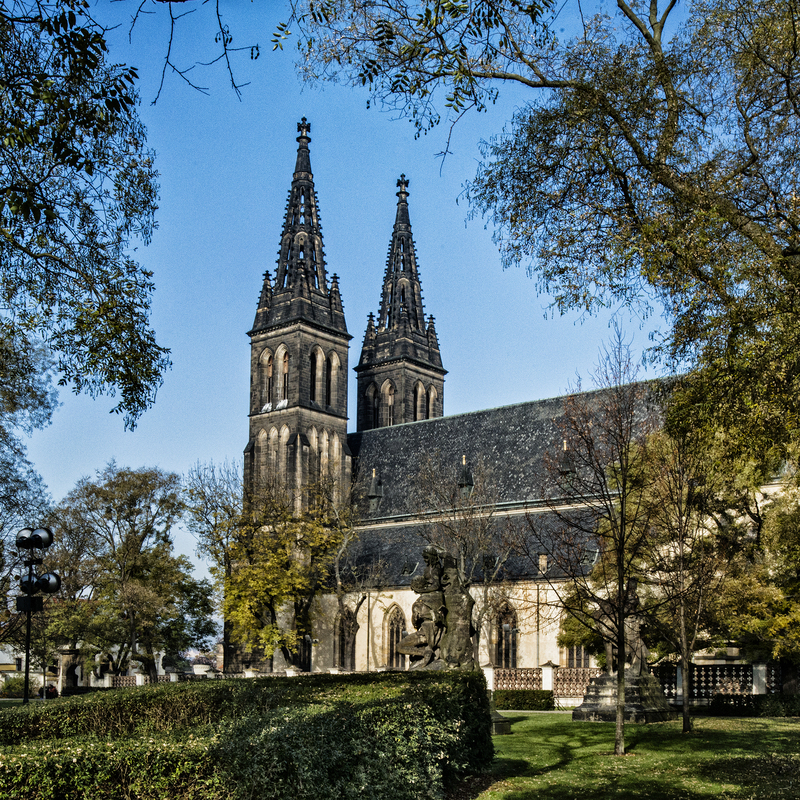 In 1875 it was purchased by the Vyšehrad Chapter and it was restored according to the design of architect Antonín Baum. Antonín König and Jan Heřman painted wall paintings in the interior, and František Sequens is the author of the altar painting. Today’s appearance is the result of several restorations. 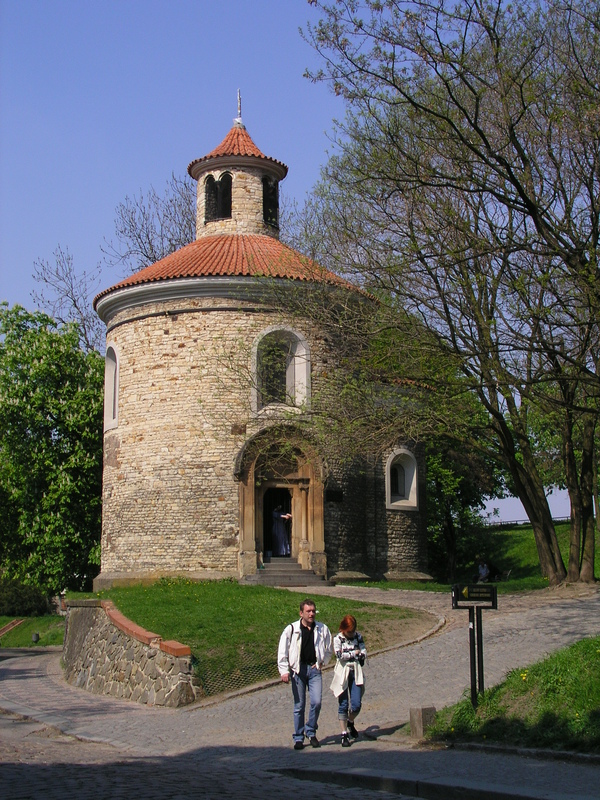 The second oldest church building at Vyšehrad was the Romanic Basilica of St. Lawrence (sv. Vavřinec), the remains of which were discovered and digged up during archaeological research in 1903 behind the pseudo-Romanic portal next to the canonry house (old deanery), No. 14. It was also built in the 2nd half of the 11th century. Regarding the Gothic monuments, the enclosure walls of the sentry bastion were preserved (the so called Baths of Libuše), and the already mentioned fragment of the Peak gate from Charles’ era. The bastion called the Baths of Libuše is a place where, according to a romantic legend, Libuše used to bathe with her lovers to throw them down to the river later via a depression in the rock. The high point where this building is located is supposedly the legendary place where the horse Šemík with his yeoman Horymír jumped into the Vltava river, thus saving him from execution. Horymír did not reconcile with the ruling Křesomysl refusing his request for the ban on the mining of silver around the Příbram area, because the people neglected the fields. He was condemned to death for a mutiny. The horse Šemík brought Horymír to the village of Neumětely with great efforts after jumping to the river, and he fell there and died, and he was also buried there. Horymír was pardoned after such a miracle. A similar story supposedly truly happened at Vyšehrad, when it was attacked by the Passau armies. One of the members of the Passau cavalry was cornered and jumped with his horse into the river. But he was noticed and beaten to death in the water. 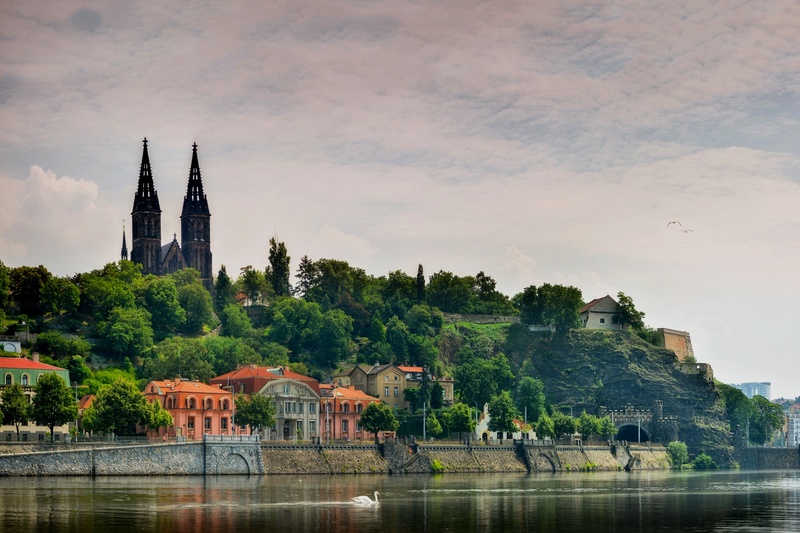 According to legends, there should be a cave inside Vyšehrad with sotred treasures, among which there should be: a silver horse given to prince Nezamysl by the Lipnice miners, a golden frog of Libuše and a golden hen with twelve golden eggs. The treasures reputedly bloom once in every hundred years. 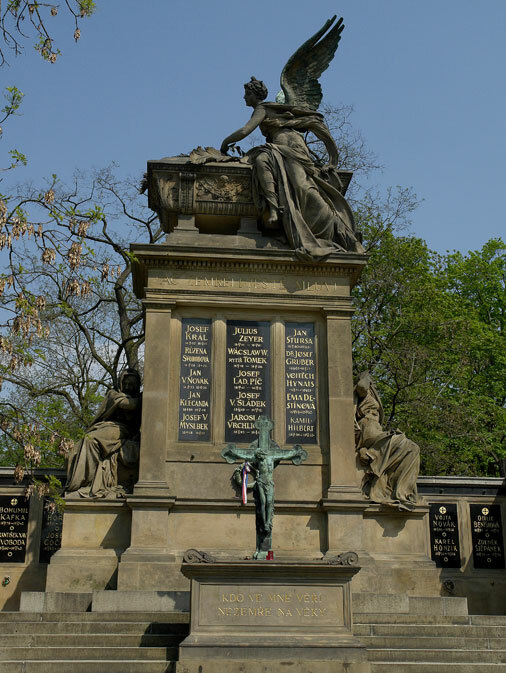 The treasures are guarded by the Bohemian lion with twelve cubs, waiting for the time when Vyšehrad, the symbol of Bohemian state, needs help. However, there is a real Vyšehrad treasure. It is a collection of historical documents and sacral objects from the property of Royal Collegiate Chapter of St. Peter and Paul at Vyšehrad. It includes Gothic, Renaissance and Baroque monstrances, a procession crucifix, a missal chalices, as well as the painting of the Vyšehrad Madonna. It is the third largest Prague treasure, after the St. Vitus treasure and the Loretto treasure. A short exhibition of this precious treasure was organized in the Lobkowicz Palace chapel in 1992 to commemorate the 900th anniversary of the death of the first Bohemian king Vratislav and the founder of the Vyšehrad Chapter. Nearby the Rotunda of St. Martin, there is a Chapel of Virgin Mary on the ramparts with a chancel in a form of a cave, which was Baroque originally, and rebuilt in new-Renaissance style in 1882 by architects Bedřich Münzberger and Antonín Baum. There is a Baroque Chapel of St. John’s Decapitation on the ramparts nearby. After 1650, Ferdinand III began to build the Vyšehrad citadel, a Baroque fortress made up of high brick ramparts shaped as a pentagram with six corner bastions. The local citizens were expelled from here. The builders were Italian. The construction followed projects of colonel Innocence, count of Conti, and Joseph Priami of Roverat, the builders were Filippo Galduzzi, Carlo Lurago and Santon Bossi. The five main bastions have patrons in St. Leopold, Ludmila, Roch, Agnes and Paul; the sixth bastion was not finished. The outside access gate from the direction of Pankrác named Táborská dates back to 1655 - 56. A little behind it, there is the already mentioned Peak with a part of the Gothic wall, and adjoining there is a small house of a popular writer Popelka Biliánová, who used to write legends about Vyšehrad and Prague, among other things, and she also organized tours around the monuments. The entrance to the actual fortress from Pankrác is represented by the Leopold’s Gate (1676 - 78) built according to a project of Carlo Lurago. It is decorated by pilasters and a gable with emblems by Giovanni Battista Allio. On the opposite side of Vyšehrad, there is the Brick Gate (Cihelná brána), an Empire building from 1871, also called New Gate or Cemetery Gate. In 1742, at the time of French occupation, the French army built casemates here. Prussian and Austrian armies, which also dwelled here, kept improving them. Narrow underground bricked corridors with loop-holes for soldiers with light arms are approx. 2 m high, and approx. 1.5 m wide. In one place, which controlled the access to Vyšehrad, there is a commemoration of a loop-hole for a canon. After several hundreds of metres, the narrow corridor ends in an enormous hall extending on 330 m2, which used to serve as the gathering place for soldiers. 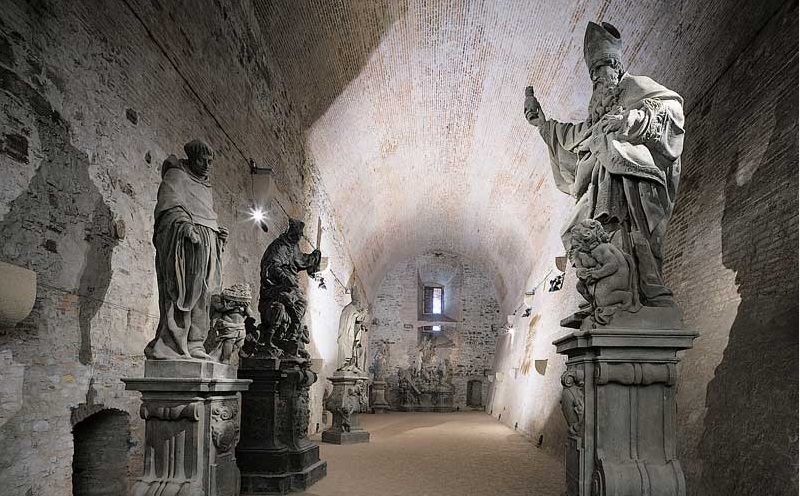 Today, this hall called Gorlice serves as a sculptural gallery of the original statues from Charles Bridge. The casemates are accessible for public today in a total length of approx. 1 kilometre, despite being much more extensive. The Prussian army wanted to destroy the fortress before leaving Vyšehrad, and so they brought 133 barrels with slow matches into the casemates. The last soldier was supposed to set them on fire and blow everything up. However, three brave citizens of Podskalí got into the casemates, with the burgrave’s consent, and carried all the slow matches out, thus saving Vyšehrad from being destroyed. They were honoured by Maria Theresa for their brave act, and they got a yearly rent of 200 gold pieces. There was a very sophisticated electric lighting in the casemates, installed by František Křižík himself. It is no longer functional, but still impresses with its perfect security. In 1883, Vyšehrad became a part of Prague and the Vyšehrad fortress was abolished. At that time, it was nothing more than a monument of the lost glory of the past. Regarding the buildings built during the 19th century, the most significant is the new-Gothic New Provost’s Residence according to projects of Prague builder Josef Niklas. The two-storied building has a trilateral bay window of St. Clement’s Chapel over the front with three windows. The chapel was consecrated by Provost Václav Štulc to grace the pope and martyr St. Clement, and the painter Josef Hellich decorated it with pictures of St. Clement and St. Václav. In 1902 the building of the Vyšehrad tunnel started. The tunnel was supposed to connect the periphery with the actual city. The tunnel has an arch with the radius of 85 m, and it is 6 m high and 9 m wide. A memorial plaque was installed on the left side, and a small tower with an observation spot was built by the river. In 1962, Vyšehrad area was declared as a national cultural monument. In 1991, part of the property within the premises was returned to the Vyšehrad Chapter, and the remaining part is owned and administered by the magistrate via a separate cultural organization named Administration of the Vyšehrad National Cultural Monument, which was established in 1970.